Introduce the chic, shiny magic of the Art Deco period into your living room, hallway or lounge. 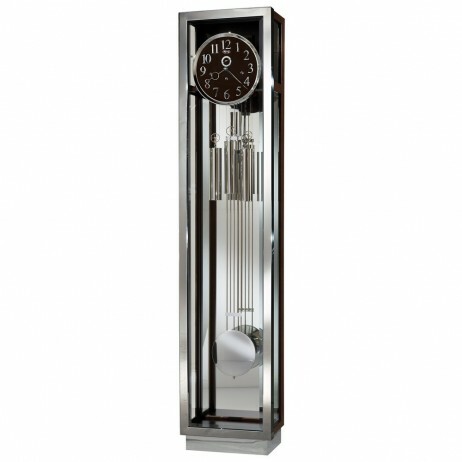 With its geometrically shaped frame, in gleaming chrome and steel and beveled glass walls, the Ridgeway Creyton Mechanical Floor Clock will certainly add a touch of glamour to its surroundings. And that is not all there is to it either. A dial with an enthralling contrast of chrome and black can be found above matching gleaming weights and a large pendulum. The clock also comes with an energy efficient LED lamp to illuminate its interior, a cable-driven, Westminster chime Kieninger movement and an automatic night time chime shut-off option. Adjustable levelers under each corner provide stability on uneven and carpeted Grandfathers. 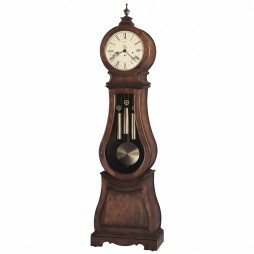 Infuse your home with a hint of classic European dcor evocative of the 18th and 19th centuries with the Ridgeway Morgantown Traditional Grandfather Clock. 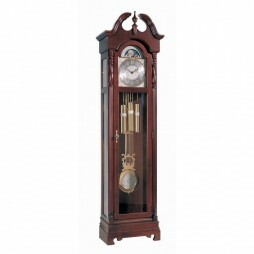 Brought to you in a Glen Arbot Cherry finish, this clock features a swan?s neck pediment, turned finial and reeded pilasters. Its highly ornate face in embossed silver features a functioning lunar calendar, in addition to golden Arabic numerals and detailed hands. And that is not all there is to this clock which possesses an elegance and sophistication which is all its own. It has also been fitted with banded weight shells, a lyre shaped pendulum with an embossed center and a chain driven movement which plays serene Westminster chimes. 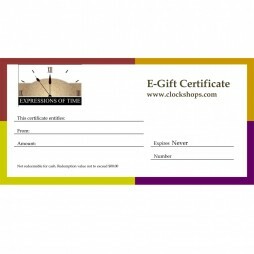 For all you colour heads out there, Nextime has created this unique clock just for you to spruce up your room. Technology meets design in this innovative clock. 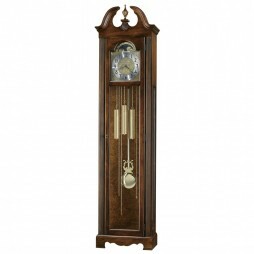 This Howard Miller Princeton Grandfather Clock offers a Hampton Cherry finish with the new Harmonic Movement with the best chime yet in a quartz clock. Decorative olive ash burl patterned back and bottom panel. The swan neck pediment features a turned urn finial with a decorative shell overlay, while the base includes a decorative cutout. This Quartz, battery operated floor clock will look good adorning the walls of your home and go well with your contemporary dcor.